Gladys Dodd, "The Early Career of Abraham L. Eisenhower, Pioneer Preacher," | PDF Version, p. 233. James C. Malin, "At What Age Did Men Become Reformers?" | PDF Version, p. 250. Lela Barnes, ed., "North Central Kansas in 1887-1889: From the Letters of Leslie and Susan Snow of Junction City," (Part 1 of 2) | PDF Version, p. 267. Louise Barry, "Kansas Before 1854: A Revised Annals, Part Eleven, 1840-1841," | PDF Version p. 324. 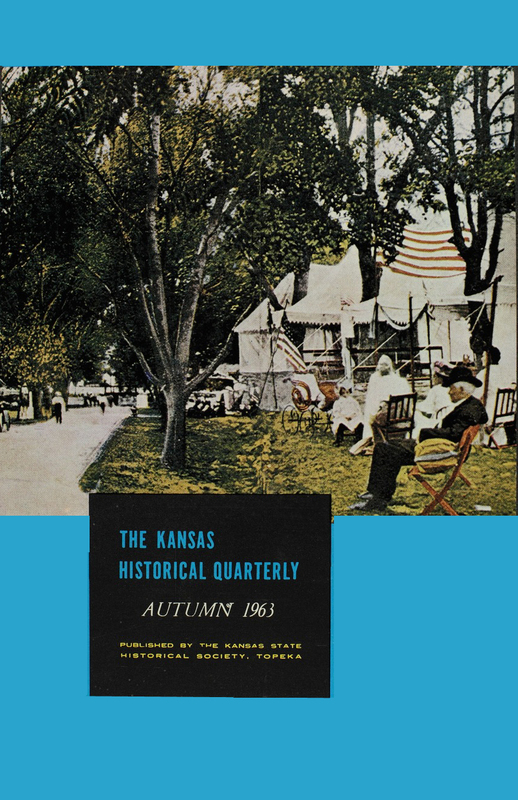 Kansas History as Published in the Press, | PDF Version p. 361. Kansas Historical Notes, | PDF Version p. 365. This post card scene depicts a soldiers' reunion in the city park at Dodge City. Post card art can be tricky. While this particular picture is reproduced from a card announcing the 1910 encampment, the Kansas State Historical Society also has an almost identical card heralding the 1914 gathering, with the car painted out! If one were to rely on the dates, it would seem that none of the persons shown on both cards had moved a muscle for four years!